So what if the Orlando Magic and Dwight Howard get to the March 15th trading deadline and the best trade for Orlando and the best situation for Howard is the Bulls? The Bulls come into Orlando Friday concerned more immediately about being 6-1 and the health of Derrick Rose, Richard Hamilton and C.J. Watson, all day-to-day with various minor injuries. But there’s that big matzoh ball hanging out there in Howard, who has said he wants to be traded and mentioned his preferred destinations as Los Angeles, Dallas and New Jersey/Brooklyn. The conventional wisdom, though we know how wrong they can be whomever they are, is that once Andrew Bynum proves himself healthy the Lakers will deal him and perhaps Pau Gasol to the Magic. Though if Bynum is healthy, it remains quite possible the Lakers will keep Bynum. After all, he’s been terrific since his return from suspension with 29 points in his first game and a 20/20 game in his third. Plus, new Lakers’ head man Jim Buss is a huge advocate of Bynum’s and is said to prefer to keep him. Plus, also losing Gasol would decimate the Lakers’ roster with Lamar Odom gone. And then if Bynum is hurt again, there’s no deal, anyway. Also, I’ve heard Howard doesn’t particularly care to follow Shaq and continue to be compared to him, that his agent is just using the Lakers to enhance any potential bidding. The Mavs have basically no trade pieces, at least hardly anyone under 40. Their general plan is to lure Dallas native Deron Williams as a free agent, and the way things are going in New Jersey it would seem Williams would only be too happy to evacuate. The Mavs’ grand plan is said to be both Williams and Howard, though they’d likely need a sign and trade for one and it hardly seems like they have anyone the Nets, especially after trading for Williams and giving up so much, or the Magic would want. So Dallas probably is out. And then comes Brooklyn. Say the Nets do make a deal involving Brook Lopez, which seems ludicrous that the Magic would take him and whatever spare parts the Nets have left or can get. They supposedly are compiling draft picks, but the Magic isn’t rebuilding with a bunch of non lottery picks. And this Nets team is now the worst in the league. But say the Magic do make such a deal. What chance do you have for any success in New Brooklyn with Deron Williams, assuming he does stay, which he may not, and basically nothing else. The Nets might have enough money to pay Howard as a walk away free agent, which those conventional wisdom types say the Magic never would allow after losing Shaq like that, but still there’s hardly anything left on the roster. And Howard makes about $25 million less. He doesn’t seem that clever. But he can figure that out. And then he still probably doesn’t even beat the Knicks. And you’re in Brooklyn. Other teams have cap room, but is Howard picking Phoenix and those extras? Charlotte, Cleveland, Utah? The latest rumor is the Warriors hopping in and even willing to rent without a promise to stay, so burned were they by even bad big men like Tyson Chandler and Nene turning down their offers. So you get Stephen Curry and the worst ankles in the world. They don’t have any big men. That’s why they want Howard. Oh, yeah, they did pay Kwame Brown $7 million. Atlanta also has made inquiries given Howard is from there. And who doesn’t want to play in front of 8,000 every night? Marvin Williams and Al Horford? OK, but so who is Howard then playing with? If he has problems with the Magic’s shooting, wait until he gets a look at Josh Smith. So Howard could after all this say he’s staying in Orlando. I wouldn’t be shocked. But after not being in the ball game, the Bulls could find themselves being called up in the bottom of the ninth. The Bulls likely could answer most of Orlando’s wishes with draft picks (their own, Charlotte’s future and perhaps Mirotic from the last draft), taking back Hedo Turkoglu and giving them a center, Joakim Noah, popular in Florida, or Omer Asik, a power forward, Taj Gibson, and a small forward near All-Star player in Luol Deng. The Magic isn’t into rebuilding, and the Nuggets did pretty well holding out for extra players in the Carmelo Anthony deal. Denver came out of it pretty whole and competitive. But then what are the Bulls? They have Derrick Rose and Howard, which is two of the top five players in the NBA to match Miami’s two of the top five. Carlos Boozer likely remains and probably Asik. You’re stuck with Turkoglu, but still have Richard Hamilton and some good role players like Ronnie Brewer, Kyle Korver, C.J. Watson and Jimmy Butler. There are some who say a post center with little outside ability like Howard is bad for a penetrating point guard like Rose. Especially in this guard oriented era when you want the middle more open. There really haven’t been any teams winning lately with great centers. Dallas with Tyson Chandler, the Lakers with Pau, who isn’t exactly a center, Boston with Kendrick Perkins. And there’s everyone’s favorite Miami with Joel Anthony, who is on the All-Star ballot. Howard got there in 2009 but lost. And what if the Bulls are playing at or near the pace they are at now come March? Do you cash in half the team for the promise of what Howard can be with Rose? It is tempting as the game is about the stars, and having two should make you elite for as long as they are together. But maybe there goes this season. Still, it presumably would be difficult to pass by. 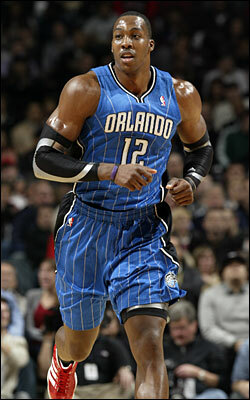 And Orlando and Dwight could come calling. Though the last All-Star centers I recall the Bulls acquiring were Nate Thurmond, Bill Cartwright and Ben Wallace. Well, Cartwright worked out OK.
Friday may not be the closest look the Bulls get at Dwight Howard. Because what if Howard cannot find love anywhere he is looking?